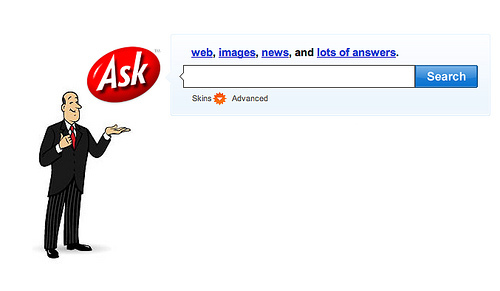 Ask.com was a major success back in the late ’90s, with its excellent (for the time) retrieval of answers and its cute butler logo, Jeeves. But times changed, and in 1998, those Californian nerds at Google began the keyword revolution. No longer were search queries executed in complete sentences, and Ask.com fell by the wayside. It attempted to follow in Google’s footsteps but never quite took off in the same way. The company is launching a major new campaign and a total redesign aimed at taking back some of that marketshare from Google. The new service is a Q&A system in which questions are directed to expert opinions collected from around the web, places like Yahoo Answers and ChaCha. If the new Ask.com can’t find your answer, it’ll direct you to the large (Ask.com says 90 million monthly) Ask.com community, where you can pose your question. Hopefully somebody knows the answer, which, in being posted, will then be around for future queries. It’s almost a throwback to the company’s early days, and it’s a smart move. Ask.com can’t compete with Google on sheer algorithmic muscle; nobody can, really. But there are chinks in Google’s armor, chinks Google itself is perfectly aware of. Google knows that curated answers can often be more useful, shown by its acquisition of Aardvark (a direct-response Q&A system) and Metaweb (which removes vocabulary-based ambiguity by referencing a directory of “entities”). But Ask.com is very close to launch, and could beat Google to the punch. The new Ask.com will be invite-only for awhile, and roll out in full sometime soon. You can apply for an invite here.